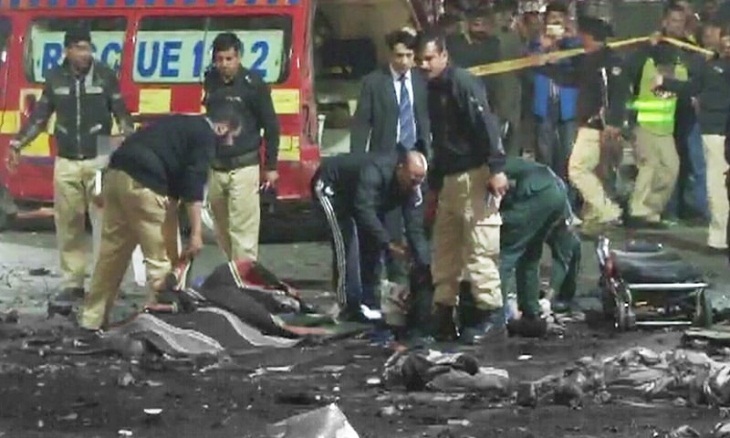 A top police official in Pakistan's northwest was killed along with his bodyguard when a suicide bomber on a motorbike rammed into their vehicle Friday morning, police said. Five other people were injured in the incident, which occurred in the restive city of Peshawar as the Additional Inspector General for Khyber Pakhtunkhwa province, Ashraf Noor, and his guard were travelling to work. Khyber Pakhtunkhwa police chief Salahuddin Mehsud told AFP that three policemen were among the five injured, and were being treated at hospital. Prime Minister Shahid Khaqan Abbasi "strongly" condemned the murder. "Our resolve to eradicate the menace of terrorism can not be shaken," he said in a statement. Peshawar, the capital of Khyber Pakhtunkhwa province near the frontier with Afghanistan, has long been a centre for militant activity in both countries. Smugglers and drug traffickers use the city as a transport hub. It has borne the brunt of militant violence for years and was the scene of the country's deadliest-ever terror attack, a Taliban assault on an army-run school in 2014 that left more than 150 people dead -- most of them children.